321792998 –NOTE: Before purchasing, check with your instructor to ensure you select the correct ISBN. Several versions of Pearson’s MyLab & Mastering products exist for each title, and registrations are not transferable. To register for and use Pearson’s MyLab & Mastering products, you may also need a Course ID, which your instructor will provide. If purchasing or renting from companies other than Pearson, the access codes for Pearson’s MyLab & Mastering products may not be included, may be incorrect, or may have been previously redeemed. Check with the seller before completing your purchase. Astronomy: The Universe at a Glance takes students on a spectacular journey across the vast cosmos. The Universe at a Glance introduces the structure and nature of the universe while emphasizing both the latest scientific findings and the process of scientific discovery. This new book by trusted authors Eric Chaisson and Steve McMillan reimagines their classic texts in a modularly organized, visual approach to learning. Here, the essential ideas, concepts, and discoveries of contemporary astronomy are presented in 15 chapters, each chapter composed of richly illustrated, two-page spreads designed to visually engage and instruct students. Complete with spectacular graphics and concise, compelling chapters, The Universe at a Glance packs an immense amount of awe-inspiring insights into a brief modular volume. 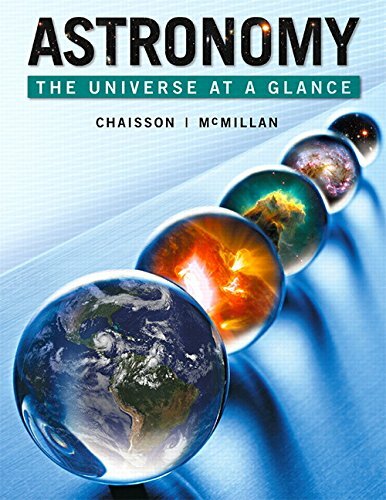 Uniting engaging prose, fascinating details, and easy-to-follow Learning Outcomes, this accessible account of astronomy is flexible and fun, an ideal complement to a dynamic introductory course. The text is integrated with MasteringAstronomy to create an unrivalled learning suite for students and instructors. MasteringAstronomy from Pearson is the leading online homework, tutorial, and assessment system, designed to improve results by engaging students before, during, and after class with powerful content. Instructors ensure students arrive ready to learn by assigning educationally effective content before class, and encourage critical thinking and retention with in-class resources such as Learning Catalytics. Students can further master concepts after class through traditional and adaptive homework assignments that provide hints and answer-specific feedback. The Mastering gradebook records scores for all automatically graded assignments in one place, while diagnostic tools give instructors access to rich data to assess student understanding and misconceptions. 0321792998 / 9780321792990 Astronomy: The Universe at a Glance Plus MasteringAstronomy with eText — Access Card Package, 1/e.